It’s been around longer than any of us. Your dad used it to protect his vehicle. Your dad’s dad used it to protect his vehicle. Your great grand-pappy used it to protect his vehicle. Wax! It’s the time tested “go-to” for most car enthusiasts who want to protect their vehicle while giving it visual benefits such as the good ol’ “wet look”. Waxes can come in many different forms. However, not all waxes are created equal. There are different grades of waxes such as carnauba A, carnauba B, etc. (FYI, Element Armor only uses the highest grades in all our products). There are different physical forms such as liquid and paste. There are certainly different materials such as Montan wax, synthetic wax, etc. Waxes do a great job when it comes to protecting your vehicle and adding great visual benefits. The drawback to wax is their short lifespan. Typically, waxes only last about 3-6 weeks. That means that you’ll need to apply it frequently. The good side is that a high quality wax is quick and easy to apply and will give you the peace of mind that you can see and feel every time you get in your vehicle. This varies based on the quality and material of wax, but a good rule of thumb would be once a month to be safe. 1. Thoroughly wash and dry the vehicle. 2. Place 4-5 pea sized drops on your foam applicator pad (for paste wax, gently wipe across the top in a circular motion). 3. Apply the wax with light pressure in a circular, back and forth and/or up and down motion, remember to stretch the wax nice and thin. 4. Wait 10 – 20 minutes before you buff off the excess wax with a clean microfiber towel. 5. Repeat steps 2-4 until your desired results are met. It is best to spread the product as thin as possible. Only a very small amount of wax sits on top of the paint. Anything else is just wasting product. Waxes can be layered to increase protection and visual effects. Glaze is like the middle child, often forgotten about but no less important. Some of you may not even be familiar with what glaze is, let alone ever seen someone apply it. A glaze is a cream that leaves behind oils or synthetic material to improve the gloss/wet look of the paint. It doesn’t remove scratches or protect the paint, but a high quality glaze could definitely make a difference. Also like the middle child, it goes smack-dab in the middle of polishing and waxing (two steps everyone has heard of). Some detailers don’t bother with glaze because it could be argued that if you polish well enough, the wax will bring out a good enough shine. Well I tend to disagree. In my opinion, if you’re going to detail a vehicle, we shouldn’t be settling for “good enough”. If you’re going to dedicate a day to detail your car, take the extra 15-20 minutes to add a layer of glaze. You never know, the middle child just might do something that amazes you. We recommend applying a glaze whenever you polish or every other time you wax. 2. Work in approx. 24″x 24″ area at a time. You don’t need to tape this off, just visualize it. 3. Place approx. 3-4 pea sized drops of your desired product on the pad or applicator. 4. With no pressure, spread the product across the entire working area (when using a buffer, the buffer should be off). 5b. If applying by machine, you should use a finishing pad. Turn the buffer on it’s lowest speed to spread the product using an overlapping “S” motion. Increase the speed to the desired level and start at one corner and using the same overlapping “S” motion, continue to the opposite corner. When you reach the opposite corner, change your direction and proceed with your overlapping “S” motion (If you first went side to side with your “S” motion, now go up and down with the “S” motion). 7. Repeat steps 2-6 until your desired results are met. Glazes can’t typically be layered, so one coat will do. A draw back to glaze is the oils left behind will sometimes prohibit waxes /sealants to bond with the paint to their maximum potential. This is why we recommend every other time you wax instead of every time. 1. First and foremost, I recommend using machine application over hand application. Polishing can be time consuming and tiring depending on the paint condition. 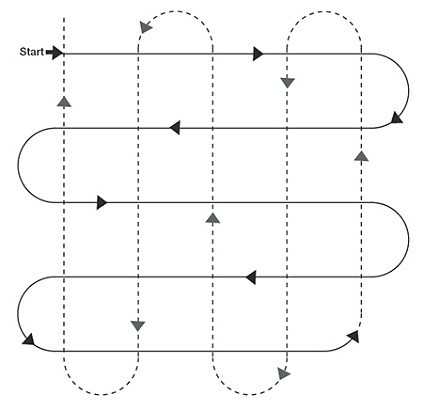 It often requires multiple passes over the vehicle using different pads (and sometimes products). Polishing also requires a degree of pressure. Needless to say, hand application would be extremely tiring as well as risking the results due to uneven application pressure. I realize that money doesn’t grow on trees, but in my honest opinion, saving up for a good quality buffer is worth the investment. 2. 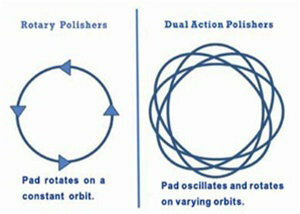 When it comes to polishing, it is always best to start from least aggressive and progress aggressiveness as needed. This rule goes for both product and pad selection. When you reach the correct product/pad aggressiveness for your job, apply as needed and regress to the least aggressive product/pad with each pass. 3. Buffer selection: A common question amongst new detailers is “What is the difference between a high speed buffer and a orbital/dual action buffer?” A high speed buffer (aka rotary buffer) only spins in a circle. It does not move in any other way other than around (Think of a circular saw. It rotates, but the base stays in place). An orbital (aka dual action) buffer rotates, but the base moves as well. Here are pictures to give you a better idea. As you can imagine, the rotary buffer packs a lot more power to one specific area. However, it makes using it a lot more dangerous as it is harder to control even pressure and could even burn straight through your clear coat/base coat if you don’t use it properly. The orbital buffer constantly moves, so it won’t damage the paint as easily. Unless you’ve been extensively trained on a rotary buffer, I would stick with an orbital. 4. Pad selection: Pads are applied to your buffer and are interchangeable. Pads come in all different sizes and levels of aggressiveness. Most manufacturers identify the aggressiveness level of the pad by color, but pay attention when ordering because the colors are not universal across all brands. We recommend about every six months. If the vehicle is properly maintained, you may be able to go longer. 1. Thoroughly wash, dry, and clay bar the vehicle. 2. Tape off an approx. 12″x 12″ square area that you want to work on. 5a. If applying by hand, make small circular motions using moderate-to-heavy pressure (depending on the condition) over the entire working area. Be sure that you try to maintain the same amount of pressure evenly over the entire area. 5b. If applying by machine, turn the buffer on it’s lowest speed to spread the product using an overlapping “S” motion. Increase the speed to the desired level and start at one corner and using the same overlapping “S” motion, continue to the opposite corner. When you reach the opposite corner, change your direction and proceed with your overlapping “S” motion (If you first went side to side with your “S” motion, now go up and down with the “S” motion). 6. Immediately wipe the working area off using a Professional Grade Microfiber Towel. Working smaller areas at a time often produce better results. Do not rush polishing. It may be time consuming, but the results are worth it. Properly match the aggressiveness of the product with the aggressiveness of the pad. Swap out your pad for a fresh one every couple of panels for best results. Use proper lighting to accurately assess your results. Smaller pads offer you more control and allow you to get into tighter areas. Tape off your trim, glass, and any other area you do not want polish to potentially damage. It was once an old myth that clay baring a vehicle was difficult and something only professionals could do. I don’t know who started this myth of why people never looked more into it, but once they did, they found that clay baring a vehicle is just as simple as washing it (if not easier). Whether you know it or not, everyday environmental fallout builds up on your vehicle’s paint and contaminates it. You could wash your vehicle every week, but you’ll still have contamination. Most of the time it is so miniscule that you cannot see it with the naked eye or even think you feel it. Clay baring a vehicle will remove this “micro-contamination”, leaving your vehicle’s paint as smooth as a baby’s bottom and properly prepped for advanced treatment (ie. polishing, waxing, etc.). Please note: Clay baring a vehicle does NOT remove oxidation, swirls, or scratches. That is an old myth as well and not true. We recommend every six months or whenever you’re about to apply a polish, glaze, etc. If you live in an area with harsh environmental conditions (ie. near sea water), you may want to perform more frequently. 2. Knead your clay bar and make one side flat. 3. Mist (generously) the lubricant over an approx. 2’x2′ area. 4. Gently glide the clay bar over your working area using overlapping passes going left to right or up and down. You do not want to rely on a lot of downward force to clean the paint. You should allow the clay to absorb the contamination. 5. Continue working on an area until all contamination is removed. You can tell this has happened because the clay will slide effortlessly across the paint. 6. Wipe off the excess clay lubricant with a microfiber towel. 7. Repeat steps 3-6 over entire vehicle. NOTE: Knead the clay bar after each section so that there is a clean fresh surface exposed. Working on a small area ensures that your clay lube will not dry up too fast. Do not use too much pressure when gliding a clay bar across the lubricated surface. Using a quick detailer that leaves behind a slick surface is often good as a clay bar lubricant. Avoid using a clay bar in direct sunlight so that your clay lubricant does not dry up quickly. Cutting your clay bar into small pieces helps preserve your clay in the event you drop a piece. Always try to reshape your clay to expose a fresh, clean piece. When storing your clay bar, mist some of your clay lubricant in the bag or container to keep is soft and flexible. It’s good practice to re-wash your vehicle after using a clay bar to remove any loosened contamination and to remove excess clay bar residue. Clay not only works well on your paint, but also your glass, wheels, plastics and other surfaces. There are many different brands and styles of foam guns on the market. Although some differ in design and ease of use, they all do the same thing in the end. Foam guns attach to either a pressure washer or standard garden hose (depending on brand and model) to create an instant mixture of water and shampoo to resulting in a foamy/sudsy rinse. Every foam gun has a reservoir where shampoo or a mix of shampoo and water get poured in. From there, the foam gun gets attached to a water source (hose, pressure washer, etc.). Once activated, the shampoo or shampoo/water gets pulled up into the flowing water and sprays a nice sudsy layer on your vehicle. Foam guns are a great addition to washing a vehicle via the Two Bucket Wash Method, as cleaning properties of the shampoo help break up and remove contaminants that the initial rinse couldn’t. As we’ve mentioned before, any steps available that reduce the need for contact with your paint will reduce any possibility of swirls and imperfections. It is important to note that a foam gun wash can help reduce the time needed for the Two Bucket Wash Method, but should not be used in place of it. Unfortunately, there has yet to be a product that will deliver the same results of a “hands on” wash that doesn’t involve touching the vehicle. Oh, I shouldn’t forget to mention that foam guns are also just down right fun to play with. 1. Thoroughly rinse the vehicle with clean water. 2. Pour the appropriate amount of shampoo or shampoo/water mix into the reservoir (the foam gun directions should suggest the appropriate amount). 3. Change the dial on the foam gun to your desired suds setting (in my opinion… more foam, more fun). 4. Attach the foam reservoir to the foam gun nozzle and shake it up a little. 5. Starting from the top of your vehicle, cover your entire vehicle in suds with the foam gun. 6. Let the vehicle sit with the suds on it for about a minute to let the shampoo break down contamination. 7. Rinse off the entire vehicle. 8. Thoroughly wash the vehicle using the Two Bucket Wash Method and dry. It’s always best practice to wash and dry in the shade, out of direct sunlight. Do you want imperfections in your paint? Probably not or you wouldn’t be reading this. Everyone loves a clean car and many people even enjoy washing their car. However, there isn’t a long list of people we know who enjoy drying the car. Lets face it, you’ve already achieved the gratification of a clean looking car. Drying just seems to be a hassle. Some may be tempted to just run a towel over it quickly so water spots don’t form and ruin the perfect wash you just did. If you’re one of those people, I direct your attention again to my opening sentence. Improperly drying your vehicle is one of the easiest and most common way to cause imperfections in the paint. Quality towels play an enormous role in the drying process. Please don’t take an old terry cloth towel to your paint! With that being said, proper towel maintenance is very important too (we’ll cover that in a later article). 1. Perform the Sheeting Method after the vehicle was been cleaned and rinsed. 2. (OPTIONAL) If you have access to a blower, blow out panel gaps, trim pieces, lug nuts, between mirrors and glass, and lights to stop any dripping. Make sure there are no loose debris on the ground or around the vehicle prior to using a blower. 3. Starting from the top of your vehicle working down, blot dry (avoid dragging as much as possible). Once your towel becomes saturated, use another. If you try to use a towel that is too wet, it will streak. Properly care and maintain your towels to ensure their long life and peak performance (we recommend Element Armor Microfiber Towel Detergent). If you’ve never heard of the sheeting method, don’t be alarmed. A lot of people haven’t. However, it’s a simple extra step that should be included into every wash process. The sheeting method allows for most of the water to be removed from the paint prior to even touching it with a towel. Proper drying techniques are just as important as washing techniques to ensure the safety of your vehicle’s paint. Any process that allows you to reduce contact from a towel to your paint is a process worth doing in my opinion. The main idea behind the sheeting method is to create a cascading effect where the water flowing onto the car combines with the water already on the surface, pulling it down off of the vehicle. When done properly, you are left with far less water on the vehicle, meaning less towel-to-paint contact. SIMPLE WIN! 1. Starting from the top of your vehicle moving left to right, flood the roof until water is pouring off the edge. 2. Quickly lower the hose a little to “catch” the water falling from the roof, this time moving right to left. 3. Lower the hose again and continue in the opposite direction moving left to right. 4. Continue this technique until you reach the lowest panels of your vehicle. 5. Finish drying your vehicle (we recommend Professional Grade Microfiber Towels). It’s good practice to wash weekly or every two weeks. Instead of wiping with your drying towel, blot the paint to minimize adding imperfections. Using a blower can help remove water between panels, mirrors, gaps, lug nuts and other hard to reach areas. Most car enthusiasts wash their vehicles often (after all, it’s probably your first or second largest investment). If you’re washing it improperly, you could be causing serious damage to your vehicle’s paint/clear coat and may not even know it. Scratches, swirl marks, “halos”, etc. are typically caused by improper washing and drying techniques. Washing your vehicle using the Two Bucket Wash Method is, in our opinion, one of the safest ways to maintain your vehicle while minimizing the possibility of adding imperfections to the paint. What also makes this method great is that it is inexpensive and extremely simple. This method has been used for decades by most professionals, and now you don’t have any reason not to join them. We recommend washing your vehicle with a quality shampoo once every week or two. 1. Prepare your two buckets by placing the grit guards in each then filling both buckets about halfway with clean water. 2. In your first bucket, pour about an ounce (or as directed on the bottle) of the shampoo in and fill the rest of the bucket with water to agitate and form suds. 3. Thoroughly rinse the vehicle with just water to remove any loose debris and dirt. This is an important step because debris (mud, leaves, pebbles, etc.) can cause serious damage to the paint. 4. Take your wash mitt and soak it in your bucket full of suds. 5. Starting from the top of your vehicle, gently glide your wash mitt across a section of your vehicle, using little to no added pressure. Wash downwards in an “S” or snake-like motion. 6. Clean your wash mitt frequently by dipping it into your second bucket (only clean water). Try to run your wash mitt over the grit guard to release as much contamination as possible. 7. Repeat steps 4-6 until your entire vehicle has been washed. 8. Thoroughly rinse off the suds from you vehicle. 9. To help remove excess water, perform the “Sheeting Method“. Use as little pressure as possible with your wash mitt. Allow the shampoo to do most of the cleaning, not your force. Using a foam gun to pre-soak your vehicle can help minimize adding imperfections. Use a separate wash mitt for your wheels and tires, heavy contaminated areas, and lightly contaminated areas. Pre-treat heavily contaminated areas of your vehicle with a degreaser. Rinse your wash mitt as frequently as possible (every panel or so). The more contaminated your vehicle is, the more often you should rinse your mitt.